Tirana /tɪˈrɑːnə/ (Standard Albanian: Tiranë; regional Gheg Albanian: Tirona) is the capital and largest city of Albania. Tirana became Albania’s capital city in 1920. The population at the 2011 census was 418,495. The Municipality of Tirana is located at (41.33°N, 19.82°E) in Tirana County, about 32 kilometers (20 mi) inland. Tirana's average altitude is 110 meters (360 ft) above sea level and its highest point measures 1,828 m (5,997.38 ft) at Mali me Gropa. The city is mostly surrounded by hills, with Dajti Mountain on the east and a slight valley opening on the north-west overlooking the Adriatic Sea in the distance. The Tiranë river runs through the city, as does the Lanë stream. The city borders the surrounding municipalities of Paskuqan, Dajt, Farkë, Vaqarr, Kashar and Kamëz. The city has four artificial lakes: the Tirana Artificial Lake around which was built the Big Park, Paskuqani Lake, Farka Lake, and Tufina Lake. Tirana is on the same parallel as Naples, Madrid, Istanbul, and New York, and on the same meridian as Budapest and Kraków. The oldest discovery in downtown Tirana was a Roman house, later transformed into an aisleless church with a mosaic-floor, dating to the 3rd century A.D., with other remains found near a medieval temple at Shengjin Fountain in the eastern suburbs. A castle possibly called Tirkan or Theranda, whose remnants are found along Murat Toptani Street, was built by Emperor Justinian in 520 A.D. and restored by Ahmed Pasha Toptani in the 18th century. The area had no special importance in Illyrian and classical times. In 1510, Marin Barleti, an Albanian Catholic priest and scholar, in the biography of the Albanian national hero Skanderbeg, Historia de vita et gestis Scanderbegi Epirotarum principis (The story of life and deeds of Skanderbeg, the prince of Epirotes), referred to this area as a small village. During this period, the Et'hem Bey Mosque, built by Molla Bey of Petrela, was constructed. It employed the best artisans in the country and was completed in 1821 by Molla's son, who was also Sulejman Bargjini's grandnephew. In 1800, the first newcomers arrived in the settlement, the so-called ortodoksit. They were Vlachs from villages near Korçë and Pogradec, who settled around modern day Park on the Artificial Lake. They started to be known as the llacifac and were the first Christians to arrive after the creation of the town. After Serb reprisals in the Debar region, thousands of locals fled to Tirana. In 1807, Tirana became the center of the Sub-Prefecture of Krujë-Tirana. After 1816, Tirana languished under the control of the Toptani family of Krujë. Later, Tirana became a Sub-Prefecture of the newly created Vilayet of Shkodër and Sanjak of Durrës. In 1889, the Albanian language started to be taught in Tirana's schools, while the patriotic club Bashkimi was founded in 1908. On 28 November 1912, the national flag was raised in agreement with Ismail Qemali. During the Balkan Wars, the town was temporarily occupied by the Serbian army and it took part in uprising of the villages led by Haxhi Qamili. In 1917, the first city outline was compiled by Austro-Hungarian architects. On 8 February 1920, the Congress of Lushnjë proclaimed Tirana as the temporary capital of Albania, which had acquired the independence in 1912. The city retained that status permanently on 31 December 1925. In 1923, the first regulatory city plan was compiled by Austrian architects. The centre of Tirana was the project of Florestano Di Fausto and Armando Brasini, well known architects of the Benito Mussolini period in Italy. Brasini laid the basis for the modern-day arrangement of the ministerial buildings in the city centre. The plan underwent revisions by Albanian architect Eshref Frashëri, Italian architect Castellani and Austrian architects Weiss and Kohler. The rectangular parallel road system of Tirana e Re district took shape, while the northern portion of the main Boulevard was opened. In the political sphere, Tirana experienced such events as intermittent attacks on the mountain pass of Shkalla e Tujanit (Tujan's Staircase) by the army of the Kingdom of Serbs, Croats and Slovenes and forces loyal to Zogu. In 1924, Tirana was at the centre of a coup d'état led by Fan S. Noli. Since 1925, when they were banned in Turkey, the Bektashis, an order of dervishes who take their name from Haji Bektash, a Sufi saint of the 13th and 14th centuries, made Tirana their primary settlement. Modern Albanian parliamentary building served as a club of officers. It was there that, in September 1928, Zog of Albania was crowned King Zog I, King of the Albanians. The period between the 1930s and 1940s was characterized by the completion of the above architectural projects, clashes between occupying forces and local resistance and the coming to power of the communists. In 1930, the northern portion of modern Dëshmorët e Kombit (National Martyrs) Boulevard) was finished and named Zog I Boulevard. Meanwhile, the ministerial complex, boulevard axis, Royal Palace (Palace of the Brigades), former municipal building, and the National Bank were still under construction. The latter is the work of the renown Italian architect Vittorio Ballio Morpurgo. In addition, Tirana served as the venue for the signing, between Fascist Italy and Albania, of the Pact of Tirana. 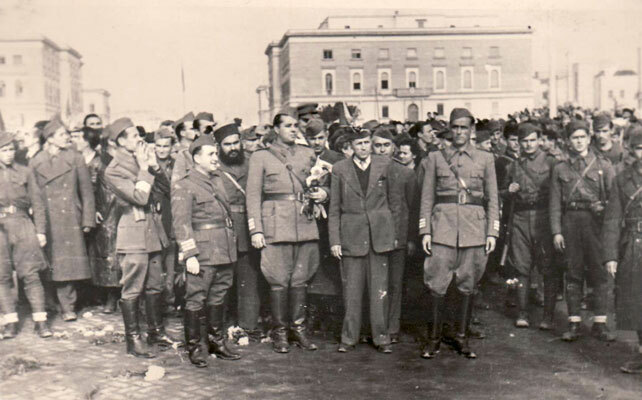 In 1939, Tirana was captured by Fascist forces appointing a puppet government. In the meantime, Italian architect Gherardo Bosio was asked to elaborate on previous plans and introduce a new project in the area of present day Mother Teresa Square. By the early 1940s, the southern portion of the main boulevard and surrounding buildings were finished and renamed with Fascist names. A failed assassination attempt was made on Victor Emmanuel III of Italy by a local resistance activist during a visit in Tirana. In November 1941, two emissaries of the Communist Party of Yugoslavia (KPJ), Miladin Popović and Dušan Mugoša, managed to call a meeting of three Albanian communist groups and founded the Communist Party of Albania, of which Enver Hoxha would shortly emerge as the leader. Prior to and after the proclamation of Albania's self-isolationist policy, a number of high-profile figures paid visits to the city, such as Soviet leader Nikita Khrushchev, Chinese Premier Zhou Enlai and East German Foreign Minister Oskar Fischer. In 1985, Tirana served as the ceremonial venue of Enver Hoxha's funeral. A few years later, Mother Teresa became the first religious figure to visit the country following Albania's long declared atheist stance. She paid respect to her mother and sister resting at a local cemetery. Starting at the campus and ending at Skanderbeg Square with the toppling of Enver Hoxha's statue, the city saw significant demonstrations by University of Tirana students, demanding political freedoms in the early 1990s. During this period, Albania was transformed from a centrally planned economy into a market economy. Private car ownership was reinstated and businesses re-established. However poor city lighting and road quality became major problems as mud, potholes, street floods, and dust became permanent features on the streets. However, all buildings and apartments were denationalized, second-hand buses introduced and modern water, telephone, and electrical systems built during 1992–1996, which form the backbone of modern Tirana. Enver Hoxha's Museum (Pyramid) was dismantled in 1991 and renamed in honor of persecuted activist Pjeter Arbnori. On the political aspect, the city witnessed a number of events. Personalities visited the capital, such as former U.S. Secretary of State James Baker and Pope John Paul II. The former visit came amidst the historical setting after the fall of communism, as hundreds of thousands were chanting in Skanderbeg Square Baker's famous saying of "Freedom works!". Pope John Paul II became the first major religious leader to visit Tirana, though Mother Teresa had visited few years prior. During the Balkans turmoil in the mid-1990s, the city experienced dramatic events such as the unfolding of the 1997 unrest in Albania and a failed coup d'état on 14 September 1998. In 1999, following the Kosovo War, Tirana Airport became a NATO airbase, serving its mission in the former Yugoslavia. In 2000, former Tirana mayor Edi Rama undertook a campaign to demolish illegal buildings around the city centre and on Lana River banks to bring the area to its pre-1990 state. In addition, Rama led the initiative to paint the façades of Tirana's buildings in bright colours, although much of their interiors continue to degrade. Public transport was privatized and newer second hand buses were introduced. Municipal services were expanded, a richer calendar of events introduced and a Municipal Police force established. Most main roads underwent reconstruction, such the Ring Road (Unaza), Kavaja Street and the main boulevard. Common areas between apartment buildings were brought back to normality after decades of neglect, while parks, city squares and sports recreational areas were renovated, giving Tirana a more European look. Although much has been achieved, critics argue that there is no clear vision on Tirana's future. Some of the pressing issues facing Tirana are loss of public space due to illegal and chaotic construction, unpaved roads in suburban areas, degradation of Tirana's Artificial Lake, rehabilitation of Skanderbeg Square, an ever present smog, the construction of a central bus station and lack of public parking space. Future plans include the construction of the Multimodal Station of Tirana and the tram line, rehabilitation of the Tiranë River area, construction of a new boulevard along the former Tirana Railway Station and the finishing of the Big Ring Road. Tirana has a humid subtropical climate (Cfa in the Köppen climate classification) and receives just enough summer precipitation to avoid Köppen's Csa Mediterranean climate classification, since every summer month has more than 40 millimetres (1.6 in) of rainfall, with hot and moderately dry/humid summers and cool and wet winters. Some snow falls almost every winter, but it usually melts quickly. Panoramic view of Tirana from Mount Dajt. According to preliminary data from the 2011 national census, the population of Tirana within city limits is 421,286. Tirana County, which can be viewed as a metropolitan area, has a population of 763,634. Many large towns and villages within the county have merged with the city, due to urban sprawl, so they can be viewed as suburbs of Tirana. Some of the large suburbs, listed as separate towns, are Kamëz (67,301), Kashar (45,742), Paskuqan (37,313) and Farkë (22,713). Thus the urban area of Tirana has a population close to 600,000. When it comes to religion, Muslims represent 55.9% of the population, while large Christian and atheist minorities collectively make up 44.1% of the population. In 1703, Tirana had about 4,000 inhabitants and by 1820 the number tripled to 12,000. The first census, conducted a few years after becoming capital, showed a total population of 10,845. During the 1950s, Tirana experienced rapid industrial growth and the population increased to about 137,000. After the end of communist rule in 1991, Tirana experienced its fastest population growth when people from rural areas moved to the capital for better economic opportunities. In 1990, Tirana had 250,000 inhabitants, but the large-scale influx increased the population to well over 500,000. Stemming from historical migratory waves, Tirana is known for its hospitality, represented in many traditional songs with the warm hospitality symbols of "bread", "salt" and "heart". ^a Population figures are given inside city limits at that time. Tirana is host to academic institutions such as the University of Tirana, Polytechnic University of Tirana, Agricultural University of Tirana, Academy of Physical Education and Sports, University of Arts (Academy of Arts of Albania), the Academy of Sciences of Albania, and the Skanderbeg Military University, national and international academic research institutions, as well as NGOs. English Base is an English Language school in Tirana. Tirana has seen the creation of private academic institutions, including: Albanian University (U.F.O - Universitas.Fabrefacta Optime), Epoka University, University of New York, Tirana, European University of Tirana, Luarasi University, Academy of Film and Multimedia "Marubi". The Municipality of Tirana is divided into 11 administrative units referred to as Njësi Bashkiake (Municipal units). These have their own mayor and council, and sometimes are known as Mini-Bashki (Mini-Municipality). In 2000, the centre of Tirana from the central campus of Tirana University up to Skanderbeg Square was declared the place of Cultural Assembly, and given state protection. The historical core of the capital lies around pedestrian only Murat Toptani Street, while the most prominent city district is Blloku. Once a secluded and heavily guarded Politbureau residential area, it has turned into a district where the young and fashionable fill the clubs and cafes. Tirana's influential elite live in the village of Selita on Tirana's outskirts. The area is famous for its villa architecture. Most of these proposals did not go through the established approval procedures and have unclear legal status. The preparation of a new master plan for Tirana was under way for almost a decade (2002–2011). Two interim reports prepared by Urbaplan - a Swiss consultant, and CoPlan - an Albanian urban planning institute were released in 2007 and 2008 respectively. However, the plan was turned down by the National Planning Council of Albania (KRRTRSH). In the meantime, the Municipality announced in 2011 that a new regulatory plan would be prepared within 2012. Tirana began to develop at the beginning of the 16th century, when a bazaar was established, and its craftsmen manufactured silk and cotton fabrics, leather, ceramics and iron, silver, and gold artifacts. Sited in a fertile plain, the Tirana area exported 2,600 barrels of olive oil and 14,000 packages of tobacco to Venice by 1769. In 1901, it had 140,000 olive trees, 400 oil mills, and 700 shops. Tirana is known for its native wealthy families. TID tower, an 85 meters business tower is being constructed in the city. Tirana has malls, such as City Park at 3 km2 (1 sq mi), QTU, Casa Italia, and Tirana East Gate. The city suffers from problems related to overpopulation, such as waste management, high levels of air pollution and significant noise pollution. Over the last decades, air pollution has become a pressing concern as the number of cars has increased. These are mostly 1990s and early 2000s diesel cars, while it is widely believed that the fuel used in Albania contains larger amounts of sulfur and lead than in the European Union. Another source of pollution are PM10 and PM2.5 inhaled particulate matter and NO2 gases resulting from rapid growth in the construction of new buildings and expanding road infrastructure. Untreated solid waste is present in the city and outskirts. Additionally, there have been complaints of excessive noise pollution. Despite the problems, the Big Park at the Tirana Artificial Lake has some effect on absorbing CO2 emissions, while over 2 000 trees have been planted around sidewalks. Tirana is a major centre for sport in Albania. Tirana's sports clubs include KF Tirana, Partizani, and Dinamo. In football, as of April 2012, the Tirana-based teams have won a combined 57 championships out of 72 championships organized by the FSHF, i.e. 79% of them. Coach and minibus (furgon) services also run to the coast and northern and southern Albania from Tirana. International coach services connect to Greece, via Korçë or Kakavije, to Kosovo[a] via the new Durrës-Morine highway, and to the Republic of Macedonia via Struga. The Ecovolis bicycle sharing system was launched in 2011. Bicycles are rented from initially four stations located at Rinia Park and along Deshmoret e Kombit Boulevard. A full day ride costs 100 leks. Cycling in the streets has been regarded as quite dangerous, because bike lanes are narrow and occupied by cars. However, in recent years, Tirana is investing in cycling infrastructure. Bike only lanes are located alongside existing sidewalks on Skanderbeg Square, Lana River and Kavaja Street, while combined bus and bike lanes are located on other main streets to alleviate overall congestion. Haxhi Hafiz Sabri Koçi Grand Mufti of Albania. ^ "www.tirana.gov.al". www.tirana.gov.al. http://www.tirana.gov.al/. Retrieved 2013-01-21. ^ a b "Population and Housing Census in Albania". Institute of Statistics of Albania. 2011. http://census.al/Resources/Data/Census2011/Instat_print%20.pdf. ^ ""Tiranasit" e ardhur rishtaz" (in sq). Gazeta Shqiptare. http://www.forumishqiptar.com/showthread.php?t=11897. Retrieved 17 August 2008. ^ Pearson, Owen (2006). Albania and King Zog: independence, republic and monarchy 1908–1939. IB Taurus. p. 140. ISBN 1-84511-013-7. http://books.google.com/?id=3_Sh3y9IMZAC&pg=PA140&dq=Congress+of+Lushnj%C3%AB+capital+tirana+Albania+and+King+Zog:#v=onepage&q&f=false. "It was decided that the Congress of Lushnje was not to be dissolved until elections had been held and the new government had taken power into its hands and begun to exercise its functions in Tirana, in opposition to the Provisional Government in Italian occupied Durrës"
^ "A bright and colourful new style of urban design emerges in Albania". Resource for Urban Design Information. http://www.rudi.net/pages/16989. Retrieved 16 August 2008. ^ Pusca, Anca (2008). "The aesthetics of change: Exploring post-Communist spaces". Global Society 22 (3): 369–386. DOI:10.1080/13600820802090512. ^ "Protesters killed in Tirana rally". SETimes.com. 2011-01-21. http://www.setimes.com/cocoon/setimes/xhtml/en_GB/features/setimes/breakingnews/2011/01/21/nb-00. Retrieved 2011-09-15. ^ Kottek, Markus (June 2006). "World Map of the Köppen-Geiger climate classiﬁcation updated". Meteorologische Zeitschrift 15 (3): 259–263. DOI:10.1127/0941-2948/2006/0130. Retrieved on 2011-02-27. ^ Dorina Pojani (2010-03-06). "Tirana City Profile, Dorina Pojani, (2010), ''Cities'' Volume 27, Issue 6, Pages 483-495". Sciencedirect.com. http://www.sciencedirect.com/science/article/pii/S0264275110000284. Retrieved 2013-01-21. ^ "Bashkia - Lajmet e Ditarit". Tirana.gov.al. http://www.tirana.gov.al/?cid=1,154,2320. Retrieved 2011-09-15. ^ Dorina Pojani (March 2011). "Urban and suburban retail development in Albania's capital after socialism". Land Use Policy. doi:10.1016/j.landusepol.2011.02.001. http://www.citeulike.org/article/9181708. ^ "Top Channel". Citeulike.org. http://www.top-channel.tv/artikull.php?id=218388&ref=fp. Retrieved 2013-01-21. ^ Environmental Center for Administration & Technology Tirana. 2008. Tirana Air Quality Report. Tirana: EU/LIFE Program; German Federal Ministry of the Environment, Nature Protection and Nuclear Safety. ^ "Dako, Alba; Lika, Mirela and Hysen Mankolli. 2008. Monitoring aspects of air quality in urban areas of Tirana and Durrës, Albania. Natura Montenegrina 7, no. 2: 549-557" (PDF). http://www.pmcg.co.me/NM7/Dako.pdf. Retrieved 2013-01-21. ^ Cameron, Rob (3 December 2004). "Tirana: Where the streets have no name". BBC News. http://news.bbc.co.uk/2/hi/europe/4062429.stm. ^ "Tirana Buses - Android-apps op Google Play". Play.google.com. http://play.google.com/store/apps/details?id=jkanini.tiranabusstations. Retrieved 2013-03-12. ^ "Ecovolis". Ecovolis. http://www.ecovolis.com/. Retrieved 2013-01-21. ^ "Tirana.gov.al". Tirana.gov.al. http://www.tirana.gov.al/?cid=1,182,1891. Retrieved 2013-01-21. ^ "The Tariqa Tijaniyya » Shaykh Ahmad Tijani and the Islamic Sacred Law (Shari’a)". Tijani.org. http://tijani.org/shaykh-ahmad-tijani-and-the-islamic-sacred-law-shari%E2%80%99a/. Retrieved 2011-09-15. ^ a b c d e f g h i j k l m n o p q r s t u v w x y z aa "Twinning Cities: International Relations" (PDF). Municipality of Tirana. www.tirana.gov.al. http://www.tirana.gov.al/common/images/International%20Relations.pdf. Retrieved 23 June 2009. ^ "Kardeş Kentleri Listesi ve 5 Mayıs Avrupa Günü Kutlaması [via WaybackMachine.com"] (in Turkish). Ankara Büyükşehir Belediyesi - Tüm Hakları Saklıdır. Archived from the original on 14 January 2009. //web.archive.org/web/20090114033014/http://www.ankara-bel.gov.tr/AbbSayfalari/hizmet_birimleri/dis_dairesi_baskanligi/avrupa_gunu_kutlamasi.aspx. Retrieved 2013-07-21. ^ "Barcelona internacional – Ciutats agermanades" (in Spanish). 2006–2009 Ajuntament de Barcelona. http://w3.bcn.es/XMLServeis/XMLHomeLinkPl/0,4022,229724149_257215678_1,00.html. Retrieved 13 July 2009. ^ International Relations. Municipality of Tirana. www.tirana.gov.al. Retrieved on 25 January 2008. ^ Pessotto, Lorenzo. "International Affairs - Twinnings and Agreements". International Affairs Service in cooperation with Servizio Telematico Pubblico. City of Torino. Archived from the original on 2013-06-18. //web.archive.org/web/20130618182559/http://www.comune.torino.it/relint/inglese/gemellaggieaccordi/index.shtml. Retrieved 2013-08-06. Blocal, Giulia (16 September 2014). "Tirana’s colorful buildings". Blocal Travel blog. http://www.blocal-travel.com/road-trip/tiranas-colorful-buildings-html/. Williams, Sean (11 July 2014). "Tirana fights to beat its addiction to cars and get its residents cycling". The Guardian. http://www.theguardian.com/cities/2014/jul/11/tirana-addiction-cars-residents-cycling-albania-capital-bicycle-communist-image. Retrieved 12 July 2014. This page uses content from the English language Wikipedia. The original content was at Tirana. The list of authors can be seen in the page history. As with this Familypedia wiki, the content of Wikipedia is available under the Creative Commons License.